View Larger Image The guys enjoy a glimpse of the Gardens before heading for an alpine camp on the Frances Glacier, 500 metres on the eastern side of the Main Divide. It was to be one of our only glimpses of that hallowed ground. A Pre-trip trip. Two of our 13 food drops had to be walked in prior to departure. Here, I’m hauling a 40kg load into Reischek Hut in the upper Rakaia. Cape Farewell – Day 1. The next day would take us up 1300 metres, out of the sun and into our first snow near Boulder Lake, Golden Bay. Mt Arthur and the Twins from the Tablelands – great views of Nelson and Golden Bay were later had on the last really fine day for a fortnight. Lydia aka “Lydzo” or “Lyds” McLean in the Matiri Valley north of Murchison just after some big rain. We had spent the night of the Kaikoura Earthquake (two days prior) at Lake Jeanette, formed by the Murchison earthquake of 1929 and below some very big granite cliffs. Luxury (said as always in a Lancashire accent). Mole Hut, Ella Range. Camping under Mount Una, Spenser Range. Here at about day 25 we were at peak fitness, cutting out climbs at about 500 metres/hour. Later, that sort of speed would remain possible, but feel a bit harder. Alexis aka “Belto”, “Bucky”, Belto-Box” Belton on Una, the high point of the Spencers. A rare summit and also a stiff one without a rope or gear. After Una and through into the Hurunui country, it rained a lot. We spent this particular afternoon at No 3 Hut brewing up ad nauseum and enjoying a bottle of “mystery liquor” perhaps a bit much. Earlier we had spent two hours in a hot pool, and it hailed the entire time. Incredible. Here, Lyds gets amongst the Introduction of something like A Short Introduction to Egyptology. Heading out the Taramakau at the Otehake confluence, near where Jacob Lauper, famous first crosser of the Whitcombe Pass, came to grief in the 1860s. Aickens corner, a long discussion on mountaineering ethics, and interesting crossings of the Otehake and Otira were coming. At Arthurs Pass we were joind by Mark aka “MD”, “MDL”, “Tyrant” or “My boy” Leslie. Much further south following much more rain. Here, the middle Rakaia country around Glenfalloch, Manuka Point and Double Hill was at its beautiful best as a nor’ wester brewed. Sometimes things get unforgettable. On this mid-December afternoon, we were heading into the Lyell Branch of the Rakaia bound for the Gardens of Eden and Allah, some of the toughest country the Island has to offer. The guys enjoy a glimpse of the Gardens before heading for an alpine camp on the Frances Glacier, 500 metres on the eastern side of the Main Divide. It was to be one of our only glimpses of that hallowed ground. Why we do it. At the same spot, high up under Malcolm Peak. We had laboured up 1200 metres in blistering heat and with packs still near 30 kilograms for this for this. In moments like this one gets to connect the country up, so connecting memories, the moment, and one’s ambitions. I can’t imagine much else that will do that for me. On the skyline is some of the finest stuff we’ve got on this Island. From left to right: Aoraki/Cook, Dampier, Vancouver, Malaspina, Silberhorn, Tasman, The Minarets, Outram, and Elie de Beaumont. Christmas eve at Scone Hut in the Perth River, out the back of Harihari. In the three full days between the last shot and this one, we had traversed both Gardens, having committed in weather that turned out worse than forecast. High on a Westland glacier in a breaking storm is no place to be, and it would give me some of the most terrifying moments of my life. I was getting hypothermia, losing my ability to behave rationally, just as they say you will. We had to commit to a very dangerous descent of the rarely-trodden Eve’s Rib, and at the bottom our tent would be destroyed in a gale at 2 am. In the next two days we would do battle a flooded Perth, often in Westland scrub and bush and, moving at 300 metres per hour max. Lyds in the Godley having crossed the main divide at Sealy Pass, Christmas day. It’s big country, and we would wind up feeling it. Due to the loss of our tent, we could no longer camp safely. This forced us into our longest single day, the hop from Scone Hut in deep Westland to Godley Hut in deep Canterbury. It involved over 2000 metres of both ascent and decent over about 12 hours. Welcome relief near Godley Hut, where Lyds’ family and a few friends came in for a Christmas party. Mt Fletcher looks on. The seldom-climbed Mt Moffat in early evening light. Next time. As good as it gets – Tasman Saddle Hut. We had arrived in zero viz in the morning, having thrillingly arrived in the Cook District over a nearly-impassable Tasman Saddle that morning. We had planned to be here on a fining forecast at least three days, and maybe 20 hours of travel, prior. The next day we would climb Elie de Beaumont, New Zealand’s fifth highest peak, in very trying condition over 17 hours. Getting up every mountain needs time, weather, conditions, friends, and maybe funds. Positioning ourselves was a significant extra challenge on the Traverse. Views over both coasts and a good deal of one’s memories make it worth the effort. Early on 2 January near Mount Cook Village, having scurried out down the Tasman in a wild storm. Here, we are running for the Hermitage Buffet, where we wanted be for its 11 am opening. Some people think that completing an Arthurs Pass – Mount Cook is a feather. I’m one of them – it’s a hard bit of country. But on arrival, we were both jubilant and dubious in making our halfway mark. On the Annette Plateau, bunking down in another bit of weather. 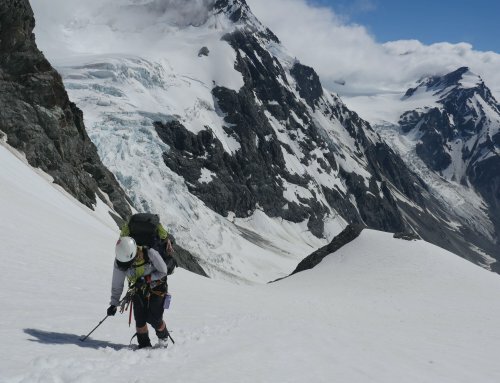 Having hauled out of Mount Cook with decently heavy packs, the freshness of our recent break evaporated. An appalling forecast would keep us away from our personal Ganges, South Westland’s Landsborough River. We had hoped to put up some unclimbed routes in that valley – undoubtedly some the finest remaining prospects to climb new stuff in true New Zealand style. This was a bitter disappointment to a group to whom Sprezzatura matters. Belton regards the Cook District from the summit of Mount Darby, high out above the Mueller Glacier. If the view was magnificent, the consolation for not crossing into the Landsborough was non-existent. On the skyline from left to right: Sefton, La Perouse, The Footstool, Hicks, Dampier, Aoraki/Cook, the Minarets, Elie, Hochstetter Done, Darwin, Malte Brun, Mannering, and eventually The Nun’s Veil. The need to tape one’s knees is no good in any way. Why we do it #2. Sunset from Elcho Hut in the Hopkins as another nor’wester rolls in. Hopkins, with Black Tower huddled to its left, dominates the scene. Weeks prior when returning from our climb of Elie, we had looked on Hopkins as a black silhouette in against golden sky far to our southwest. On that occasion I was looking towards my Otago home, it was an unforgettable sunset that closed out an unforgettable day. This time was hill’s turn to glow gold on black to the north east, having me look on and think of my recent past and present life in Canterbury. It was fabulous piece of symmetry, and another walking talking example of staring memories, moments and ambitions in the face all at once. Rain rain rain. Lyds arrives in the Matukituki valley. This was a personal high point for me: It had taken me three months, but I had walked Home. The people of the mountains are a big part of what brings it to life. On this late January day, I was lucky enough to run into Willy Aspinall, brother of the legendary and late John, and give him a hand shifting a mob of ewes up to Cameron Flat from the homestad. This was country I’d loved since I was young boy, and the cuppas, the grandchildren knocking about with dogs, and the yarns of deer live capture days were as good as any snowfield. Pass punishers. Here MD and Lydzo close out the climb of Cascade Saddle in quick time. As tourists and agricultural pundits put have it: “this is New Zealand”. Aspiring, French Ridge and more memories looks on a kea in the wind. Mark, Alexis, Lydia and I at Te Anau Downs, shortly before finishing up. I was forced to finish from here by bike and raft due to the re-surfacing of an injury picked up in winter. The other guys had a magnificent finish through Fiordland’s Heath Mountains and Lake Poteriteri. 103 days out of Cape Farewell, I found myself at Papatotara Road, Tuatapere, and about 100 metres and only moments away of the South Coast. I was handed a beer.